JUST 8 BITS, WHAT CAN YOU DO WITH? This is the part where you get bored with useless details about insignificant achievements made at an early age. But there is more to understand than just "I did X at age Y". What really counts is why and are there any funny stories along the way? Yes there are. I've always been the type of person that looks beyond the dials and displays, which make up the "face" of the device. If you look close enough to a TV screen, you will see flashing dots. Of course, take a step back and those dots just showed your favorite team winning the superbowl. But that didn't fascinate me as much as the flashing dots. How did they come to flash? It must be real important, because everyone in the room was cheering!?! "Electricity makes it work", was the only answer I could get at such a young age. I knew electricity came from the outlet on the wall and it traveled through cables. I then learned a dozen new ways to blow fuses and "felt" what electricity could do. Electricity also came from batteries and could be turned into sound when connected to a speaker! Amazing. 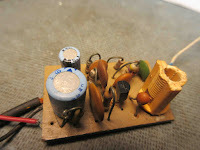 My father had been repairing Tube TV's; the chassis was a city, the tubes looked like high rise buildings and the wires made up the roads between them. Fortunately for me, my father had a stack of lesson books from Devry. The Radio and TV were no longer seen as appliances, they were a collection of technology. Books and magazines fueled this growth. Thank you Forrest Mims. In Jr High School, I put together a small device that made sound when exposed to light. A teacher there taught me how to play a joke by placing it inside another teacher's desk and together we had a good laugh when the drawer was opened. Of course there were many steps along the way but let's skip all that. However, I must call attention to one really cool project, the building of a COSMAC ELF computer in 1980. But I promised you funny stories! In high school, I built several miniature FM Transmitters, wireless microphones. Now, as an adolescent boy... where do you think I could have planted such devices? The best story involves two class mates that were cheating in accounting class. From low marks, this student started getting A+, just from using one of these transmitters! The teacher was confused and never discovered the trick. Picture of the first transmitter. Microphone was added in the next revision. My hobbies today include vintage computing, which is full of amazing hardware and great stories. It must be nice to one-up Bill Gates at his own game. Now, if we could just get a comment from him that would be cool. I am sure he would suggest a reason why his boot loader is better, and needs the extra bytes, but who knows? Regarding school memories, I too transmitted data to a friend, but not via radio waves. In grade 8, I created a small message encryption program that we each got took a copy of. My computer was a Vic20 and his was a 64. I would type a message on my computer, and it would encrypt and save it to cassette tape. (I couldn't afford a disk drive). At school, I would hand him the cassette, and when he got home, he loaded the messaging program which prompted for the encrypted message tape and a password. If the correct password was supplied he could read and then reply to the message. Practical? Not at all. But in my mind it was akin to the self destructing cassette messages you would see on spy TV shows.